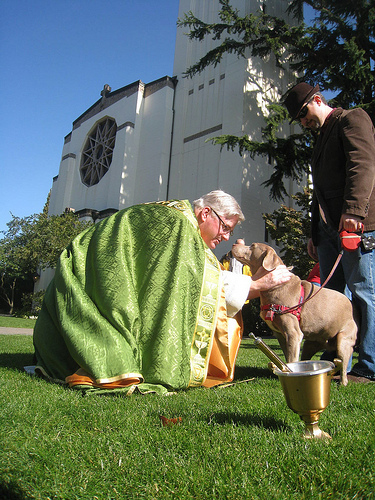 A Hymn for Blessing the Animals: "O God, Your Creatures Fill the Earth"
This weekend and on St. Francis Day (Oct. 4) some churches are having services for the blessing of animals. The following new hymn can be used for these services as well as any worship service celebrating God's creation and our call to care for it. You made the pets we welcome in- They're wondrous blessings, too. We're called to have dominion here--To care for them always. Hymn Use Permission: Churches that support Sojourners have permission to use these hymns. This hymn is available formatted with the music  as a free PDF from the United Methodist Worship Office and the Humane Society in the United States. There are many wonderful references to animals, and to the care of animals, throughout the Bible. Psalm 104  is a prayer that recognizes many creatures that are part of God’s good creation. Psalm 148  calls on God’s creatures (“sea monsters… wild animals… all cattle… creeping things and flying birds…”) to praise the Lord. The Ten Commandments’ instruction about rest on the Sabbath includes livestock (Deuteronomy 5:14 ). Jesus’ teaching when he heals a man on the Sabbath (Matthew 12:9-14 ) assumes that, of course, righteous people will care for their animals and keep them safe from harm. Luke 15  reminds us that God is like a good shepherd who cares for every single sheep and goes after the one that is lost. Luke 12:6  tells us that God knows and cares when even a sparrow falls to the ground. In the creation stories in Genesis 1-2 , God tells human beings to “have dominion”—to lovingly care for all that God has made, including the animals. 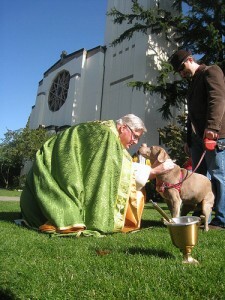 Hymn Video Contest : Humane Society Faith Outreach Program is giving away free copies of their “St. Francis in a Box” toolkit of resources ” (valued over $100) to all churches that send them a video of their singing this new hymn. Top prize winners will get copies of the Green Bible  and other prizes.